Publisher, Raw Fury and developer Plausible Concept, have announced a new game, Bad North. Bad North bills itself as a "real time tactics roguelite," and while I've become instantly wary of any game calling itself a "roguelike" (most developers don't seem to have actually played Rogue), this one looks really, really good. 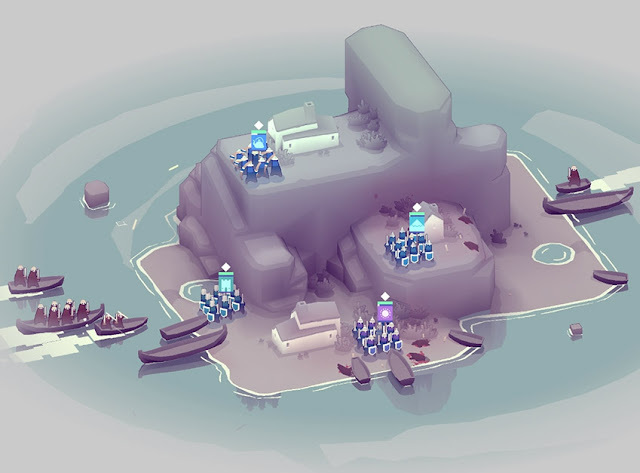 In short, you command a bunch of soldiers looking to defend a procedurally-generated island from invading hordes of vikings. The action plays out in real time, but you have full control over where you place your units, which makes the game sound a little like an evolution in the tower defence genre, more than anything else. We are promised that it will be brutally challenging and charming at the same time, as per the press release: "It’s charmingly brutal, with beautiful procedurally-generated islands and adorable soldiers juxtaposed against the blood-stained realities of war." And I mean, any developer that uses words like juxtaposed clearly has a firm grasp over storytelling. With that procedural generation this game could well be an endless kind of game that is easy to pick up and play in small bursts, always trying to do a little better than what you managed last time. That makes it perfect for Nintendo Switch, which is great, because the game will indeed launch on Switch, along with PC, the other consoles, and mobile devices. So everyone will get to play!